ENDLESS stretches of palm-fringed beaches with emerald seas, white sands and golden sunlight. Fresh water lagoons for quiet introspection. Breathtaking underwater worlds of colourful marine life. And mist-shrouded hills of primeval rainforests. All this and much more comprise the coastal life of Malaysia. If Kuala Lumpur is a hub of commercial activity, the islands of Malaysia offer a relaxed atmosphere and the laid-back ambience typical of small towns. Indeed, endowed with a long coastline and numerous off-shore islands, Malaysia offers a lot to the traveller. Penang, Langkawi and Malacca are three such islands our 19-member team is taken to by Malaysia's Mega Familiarisation Tour programme. It's a 45-minute flight from Kuala Lumpur to Penang. Fine beaches and interesting sights have made it one of the most popular destinations in the region. Georgetown, the capital of Penang state, itself has a distinctive character. As we drive down in a Malaysian Tourism bus, we are transported into a bygone era. Gaily decorated trishaws offer tourists a fun way of taking in the island's sights at a leisurely pace. In fact, the general attitude of the residents is quite laid-back—a pleasant change from the hectic life we are used to in big cities. Penang is not called the 'Pearl of the Orient' without reason. The Batu Ferringhi area along the western coast has some of Penang's famous beaches. These are ideal for all types of water sports. Off-shore from Batu Ferringhi are the deserted islands of Palau Bidan, Pulau Telur and Pulau Song Song. Then there is the Miami Beach and like most old towns a 'haunted house'. Our guide Saul, a Chinese settler, tells us that certain daring persons took up the challenge and slept inside the house. They found themselves outside the house on waking up, with the door still bolted from inside! We stop for lunch at a small open-air restaurant optimistically named The Palace. In fact, dining in Penang is a delight with restaurants and hotels offering a variety of seafood — local, continental and Asian dishes. Our guide informs us that Malaysians are good at two things—eating and shopping. Why then would tourists lag behind? We visit certain duty-free shops for cameras, watches, pens, cosmetics etc. Those in search of antiques and bric-a-brac, the row of junk shops along the Rope walk is the right spot. Chowrasta Market on Jalan Penang is an interesting place for bargains on local products. Batik, pewter, pottery, jewellery may also be found at the main shopping area around Jelan Penang, Lebuh Campbell and KOMTAR shopping complex. The 65-storeyed KOMTAR is the tallest building in South-East Asia. From the top of the building one can catch a glimpse of Penang city in the night and also the Penang Bridge, the longest in Asia. This 13.5-km bridge spans the channel from the Penang island to the mainland. Buses are, however, not allowed on it due to its narrow width. Mopeds with lights on, even in daylight, are a common sight. Georgetown has several historical and cultural landmarks. The statue of Capt Francis Light, the discoverer of the island, stands out in front of the building. According to local legend, Captain Light had fired gold coins into the surrounding jungles to induce the labour force he had brought from South India into clearing the area. The museum is just a 10-minute drive from Sheraton Penang Hotel where we have checked in, and the entry fee is just RM 1. The spot where Captain Light first landed is Fort Cornwallis. Nearby is St George's Church. The entrance to this Anglican church is named after the patron saint of England, and features a memorial canopy dedicated to Captain Light. The other visiting spots are Kapitan Keling Mosque and Acheen Street Mosque, the Temple of the Goddess of Mercy, Sri Mariamman Temple and 8 km from Georgetown the Botanical Gardens. Dinner at Sheraton Penang Hotel itself is a relaxed affair. The hostess, a petite and smiling girl Rina, gives us company. She reveals how her grandparents came from Pakistan and settled in Penang for good. We have had a long day and decide to retire to our rooms, but some others in our group, still burning with energy, go to the hotel's karaoke lounge to sing their hearts out. The next morning we catch a flight to the most beautiful destination — Pulan Langkawi, the largest island in a cluster of 99 islands known for their legends and lovely beaches. Even our stay at Sheraton Langkawi Beach Resort is a delight. The rooms done up in Malaysian architecture within a natural rainforest environment have a view of the sea. The two-storey units blend harmoniously into the lush foliage. After a sumptuous breakfast, mainly of fruits comprising mangosteen, water melons, guavas, tiny bananas as well as the Western and Malaysian varieties, our guide Rajah drives us to Dataran Eagle or Eagle Square, the most prominent landmark for visitors arriving by sea. Langkawi derives its name from the eagle or helang. Our next stop is Underwater World Langkawi, a marine showcase featuring both fresh and salt water fish and other forms of marine life. Located at Pantai Cenang, a popular beach on the island, the aquarium features more than 5,000 types of marine life. The favourite is the killer shark against whose backdrop most of us got photographed. Lunch at Little India Cuisine is a delightful Indian fare served by South Indian staff. A trip to the island is not complete without a visit to Mahsuris’ Mausoleum, 12 km from Kuah, the main town of Langkawi. A hut on stilts has four musicians seated under the raised floor. At our request, they play tunes of songs from old film Sangam. The shrine itself is in honour of a local maiden Mahsuri, who during her husband’s absence, was unjustly accused of adultery. She was executed for committing adultery and the legend holds that Mahsuri’s innocence became apparent when white blood flowed from her body. In her dying breath, she laid a curse on the island that it would henceforth cease to prosper for seven generations. It could be a co-incidence that it is only now, after seven generations, that Langkawi has come on the world map and gained recognition. 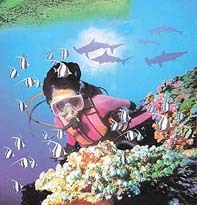 Langkawi became a duty-free port in 1987. It’s duty-free status allows visitors to pick up products at prices that are unbeatable. To get a feel of the white beaches, we go by a motor boat to Pulau Dayan Bunting island, known for its fresh water lake, Tasik Dayang Bunting (Lake of the Pregnant Maiden). The outline of the hills and rocky outcrops on one side of the lake resembles the shape of a pregnant maiden lying on her back. 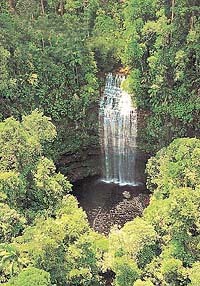 The name of the island and the lake is attributed to the legend of a fairy princess who married an earthly prince. Her first child died shortly after birth. She buried the child in the crystal clear waters of the lake and before returning to her celestial abode she blessed the waters so that any childless maiden who bathed in the lake would conceive thereafter. Now it’s water is said to work miracles for childless couples. We stop at the beach on the Pulau Perhentia island. Some of our teams mates go swimming and a few para-sailing. But most of us are content to waddle in the shallow waters on the shore or sit around and enjoy the scene of windswept palms, powdery white beach and sapphire blue waters — it’s sheer heaven. You are almost lulled into taking things easy and let the world pass by. We wind up our nine-day tour of Malaysia at another island, Malacca. 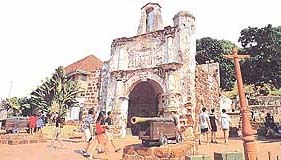 A state with a wealth of history, Malacca was ruled by the Portuguese, the Dutch and the British. Consequently, it is a cultural melting pot. The Portuguese community has remained a distinctive feature of society in Malacca. Rightly Malacca has been officially declared the ‘‘Historical City of Malaysia’’. Our guide, G.K. Ravi, who was with us at the beginning of the tour, leads us to some of the historical landmarks of the city. The most famous is the A’Famosa fortress a most-photographed subject. Among the churches are the Christ Church, St Paul’s Church and St Peter’s Church. The Kampung Kling and Kampung Hulu’s Mosques are other architectural delights. There are also several Hindu and Chinese temples depicting a fine workmanship. We are, in particular, interested in the Hang Li Poh’s Well. Legend has it that it never dries up. It is believed that anyone who drinks its water always returns to Malacca time and again. Our guide advises us against drinking the water because the Portuguese and later the Dutch poisoned it. ‘‘One may never leave the place,’’ he laughs. However, now it has become a wishing well and people throw coins in it. In fact, the best way to learn the history of Malacca is through the light-and-sound show held at Dataran Pahlawan, similar to the kind held at the Red Fort in Delhi. We lunch at Ole Sayang restaurant and partake Malayan fare which includes stong sambal (squid), udang (chicken) and cendal (a dessert made of pandan leaves in coconut milk). It’s our last day in Malacca. We have been putting up at A’ Famosa Resort Hotel. The flight is in the evening. So Malaysian Tourism officials decide to take us to the resort’s Animal World Safari. We get to see four spectacular shows by monkey, elephant and bird ‘artistes’. The appearance of scores of long-legged bird ‘beauties’ please spectators into eliciting a loud ‘Wow!’ The last act is the Wild West show — what with the Red Indian and cowboys, old shacks and pistol fights. An adventurous safari on a truck takes us the through the park where the big cats, kangaroos, giraffes, deer and the like abound. By 4 pm we are at the KL airport for our 6 O’clock flight back to New Delhi. It’s been a truly memorable tour. Indeed, a dream holiday come true in fascinating Malaysia.